So what are beef cheeks? You know how some people say that if you don’t want to know the answer to a question.. don’t ask? 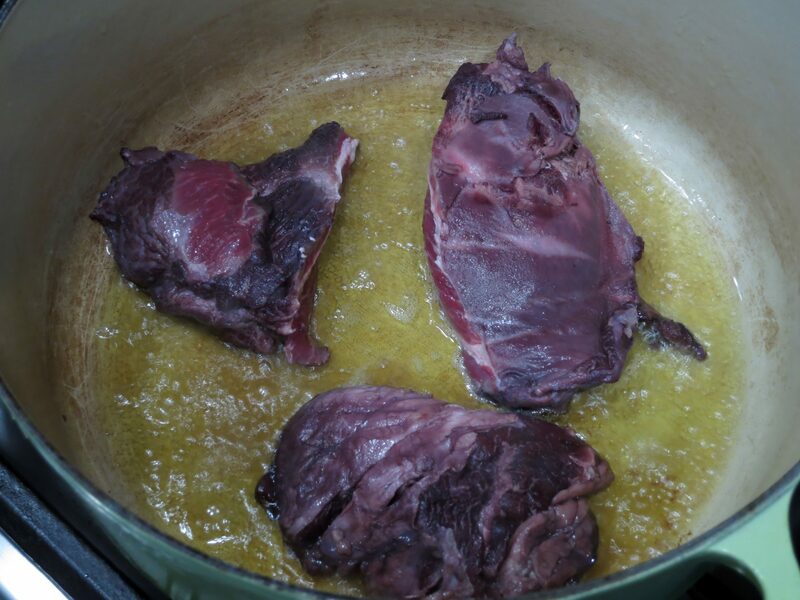 Well, beef cheeks are just that – cheeks from cows’ heads. Or would that be faces? 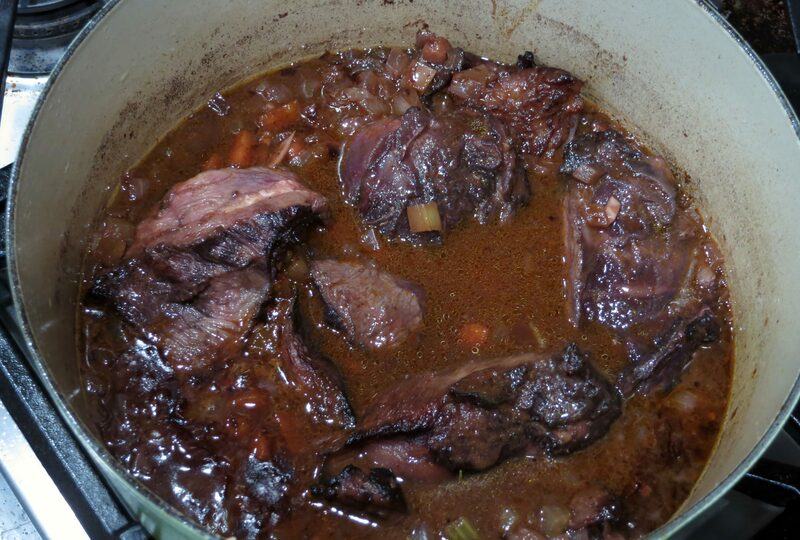 Surprisingly, the other day at the grocery store, I came across beef cheeks, and I’d never cooked them before. I’ve had them at restaurants – I think most often as an hors d’oeuvre. So it was time to try them out as a main course. They’re a very tough piece of meat, so braising was the only way to go. So here’s what I did. Place the cheeks in a large, non-reactive bowl. add the wine, onion, rosemary, and garlic. Then cover everything with the bottle of wine. Refrigerate overnight, for at least 12 hours. The next day, remove the cheeks and lay them on paper towels to dry. Pour the marinade through a sieve and set it aside; discard the onion and other goodies. Heat some oil in a large Dutch oven over high heat. Cut up the cheeks into workable pieces, then season them on both sides with salt and pepper. Brown the cheeks, about 2 minutes on both sides, without crowding them. Set the browned cheeks on a plate, and continue with the remaining pieces. 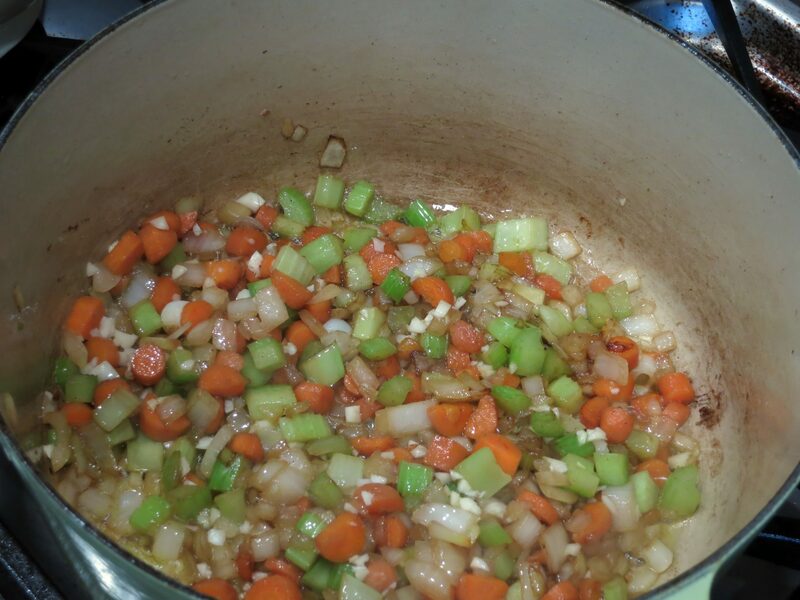 Then lower the heat to medium and add the onion, celery, and carrot. Saute the vegetables for 5 minutes. Stir in the garlic and saute for just a minute. 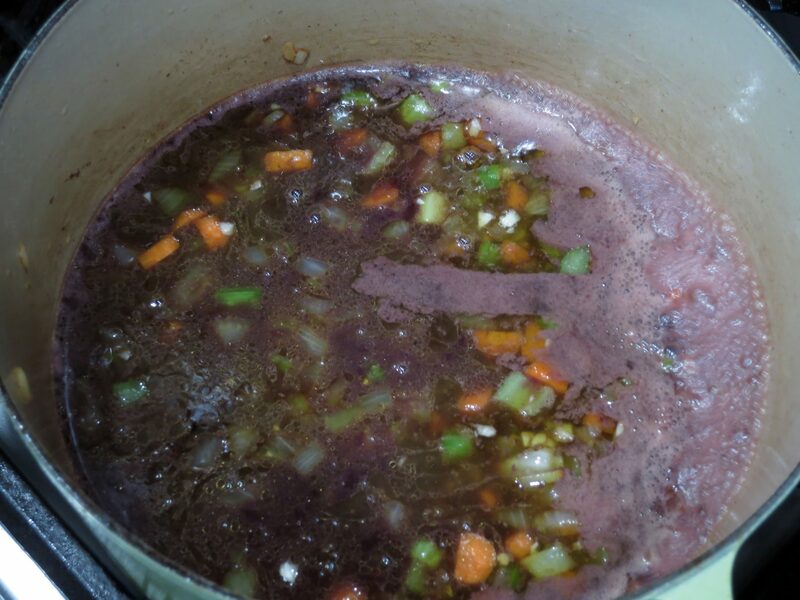 Then add the remaining marinade, and the beef broth. Reduce the mixture by about half. When the liquid has reduced, stir in the tomato paste and the paprika paste. Return the cheeks to the pot, including any liquid that might have accumulated on the plate, and bring the liquid to a boil. Cover the pot, reduce the heat, and simmer the cheeks for about 2 1/2 hours. Turn the pieces over about halfway through the cooking time – especially if they’re not completely submerged in the liquid. Remove the lid from the pot, and let everything cool down. Refrigerate overnight. The next day, remove the cheeks and slice them thinly. You can strain the liquid in the pot to remove the aromatics, but I left them as is. Place the cheek slices in the liquid and heat slowly until heated through. Taste the liquid and add salt, if necessary. I served the cheek slices on top of cheesy polenta, topped with some of the braising liquid. Alternatively, you could also strain the braising liquid and make more of a gravy with it, but I preferred a more rustic presentation. If you need a recipe for making polenta, which are also grits (they’re both cornmeal), there’s a recipe here and one here. The combination was really fantastic. And I enjoyed beef cheeks as a main course. They’re almost like beef tongue, but much softer. They were also very inexpensive. Does this piece of meat require any extra tenderizing? Hahaha! No, the braising does all the work! Happy new year! Well I may give these a try then…Happy New Year to you too! 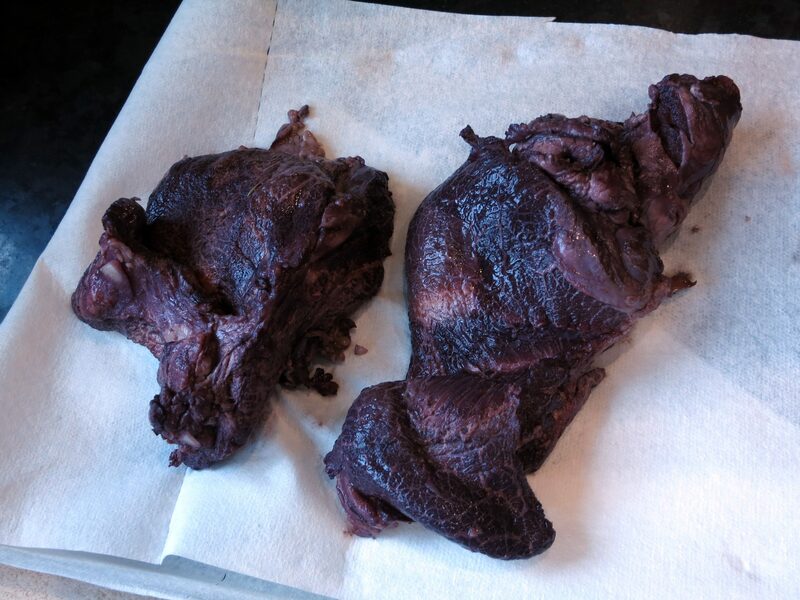 After the time braising, they’re tender, although in a beef cheek sort of way… Thanks! This looks like a great preparation for this cut of meat! Thank you! It’s like a nice rich stew… with a twist! 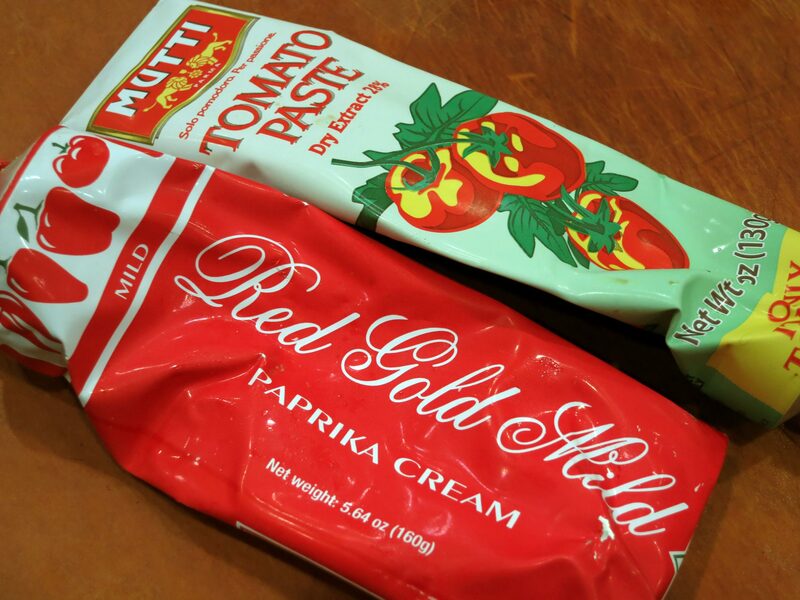 Never heard of paprika paste! Wonder if I can find it round here. 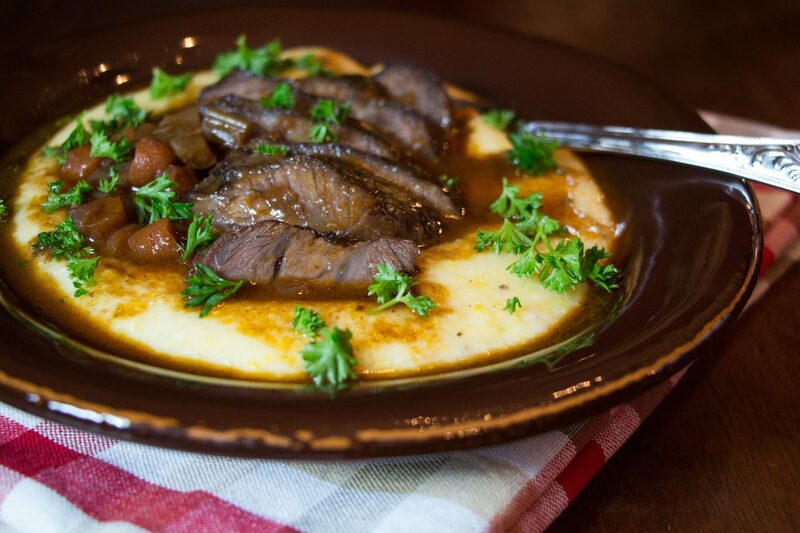 Beef cheeks and tongue are on my list to experiment with and this is a great recipe. Very nice Mimi. I haven’t cooked them before. Another one to try. I prefer tongue to cheeks, but they’re both inexpensive and pretty wonderful! Happy New Year Conor! Thank you! A very hearty dish! I have been wanting to try them myself. They always look so delicious! Tongue is really fabulous! Happy new year shanna! show stopper.. I seriously had to click on this. Looks so delicious. I love your plating as well. Beautiful! This looks just delicious! I like the idea of the polenta too. 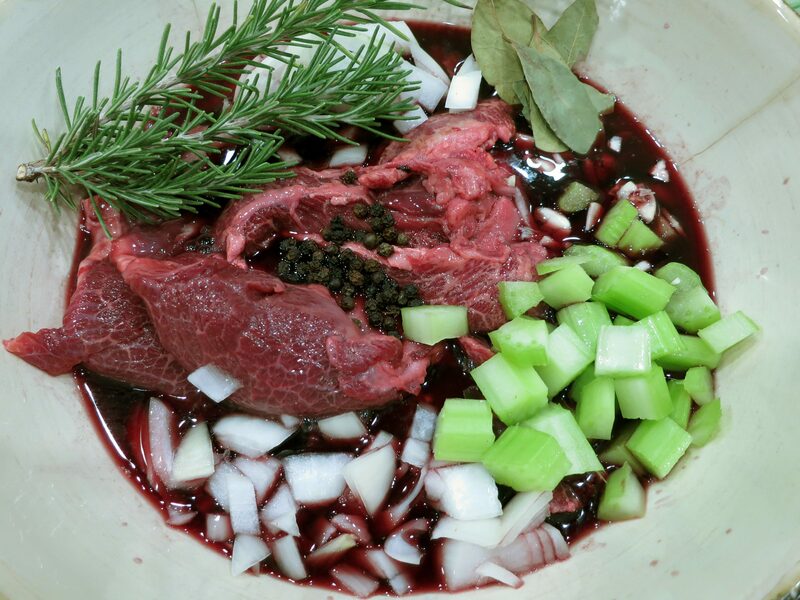 Have never eaten beef cheeks … but I’m not a big beefeater – we make a dish for Christmas using most of a pig head. Very interesting dish … first I thought you served it with girt – that I’m not so passionate about, but I love polenta. A Happy New Year to you and thanks for 2013. I would love to hear more about this pig head dish!!! It’s been a joy, although sometimes bittersweet as well, to read your blog. Here’s to a wonderful 2014 ! I think the right word is jellied – as we eat as a cold cut. I will see if I can find a recipe. My grandma made it every Christmas. I know … I had my ups and downs this year – but that is life. Didn’t know that you read my blog .. thank you so much. One of the best meals I have ever had was beef cheeks at Michael Smith’s in KC. I’ve never even thought about looking for them in the meat market. Doh! Thanks for sharing this recipe. I will start looking. I found them at Walmart, of all places. The Mexicans must cook with them a lot. I found them next to tripe. Not trying to make a cultural/political statement, it’s just that that’s where I found the cheeks! Beef cheeks are my favourite cut to braise. I just love that rich, melt in the mouth tenderness! Wonderful post, hopefully it will encourage more people to cook this undervalued cut! Aren’t they fabulous! And, inexpensive. btw, i just had a 30 USD multiple courses lunch, one of the dish is sousvide beef cheeks, and it’s pretty damn good! Sous vide beef cheeks! I should have thought about that! I love my sous vide machine! This looks delightful. I’ve never seen beef cheeks in the supermarket before, but I should check it out. The recipe looks nice for other cuts too. This recipe really is just a braise – you’re right, it could easily be a stew like a beef bourguignon. Thanks for stopping by – I love your blog! 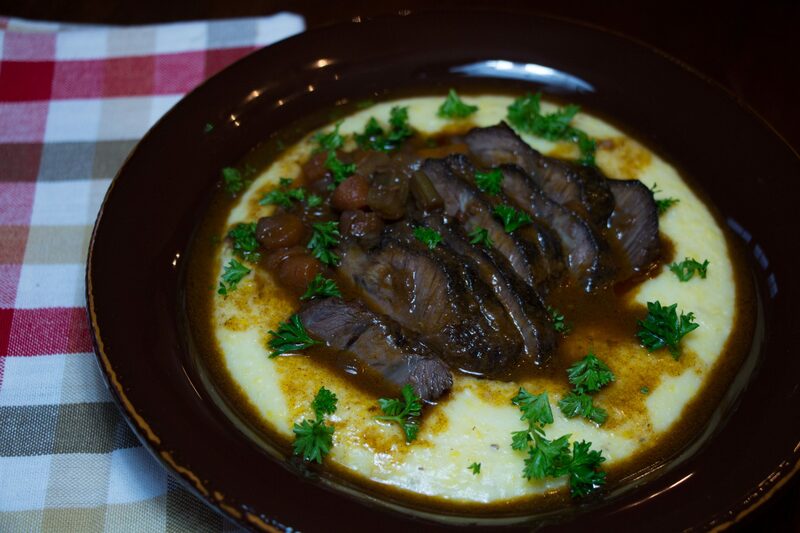 Its been such a long time since I’ve had beef cheeks they are delicious, love that you served over polenta, that delicious rich sauce with the meat and creamy polenta sounds so good. It turned out to be a wonderful combination! Happy New Year Suzanne! I made these for my family last weekend and the braising made the meat easy to eat and cut just like you said. I couldn’t wait until my family finished eating so I could spring on them that they just ate “beef cheeks”. Well when I told them they all paused a minute, looked at each other and then said they didn’t care what the meat was they wanted more!